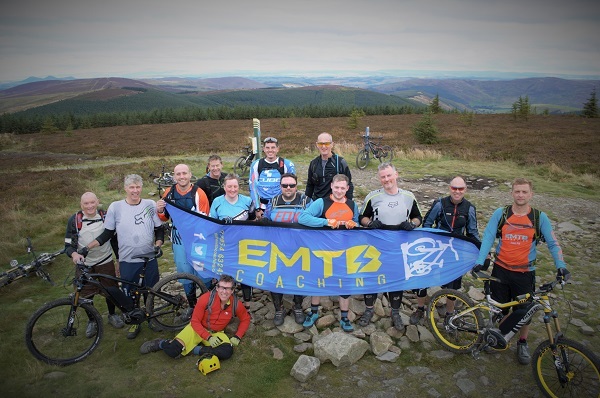 EMTB Coaching took 10 customers to Scotland for the UK’s first eBike holiday. Our four day trip was very nerve racking to begin with but soon realisation kicked in to how well it was going to be. Friday was a long day spent in the EMTB Coaching team van for 6 hours in the direction of North. We had a busy morning packing the van with team kit, bikes, spares and our luggage. Heading to Peebles was pretty straight forward with only 3 roads to use its alot easier than somewhere closer which uses tight country lanes. Once in Peebles the hotel is smack in the middle of the town with pubs, chip shops, kebab houses and curry stations all a stones throw from the front door. The hotel is a 1800’s building which stands out lovely but having been earlier in the year for our recce we knew the service and facilities was the best part. Unpacking the van, signing in to our 5 rooms and getting the first beer in was all done in record time ready to meet and greet our guests. Slowly they arrived one by one with no problems at all, greeted with a drink everyone congregated in the hotel bar for a briefing before sitting down for dinner. The socialising through the Friday evening was excellent, looking back now this was essential for the group. Saturday morning we woke to meet in the breakfast hall where our full buffet style breakfast was served, as much as the temptation was there to eat our body mass in one meal with lots to choose from we had to remember not to fill ourselves as the riding would become difficult. 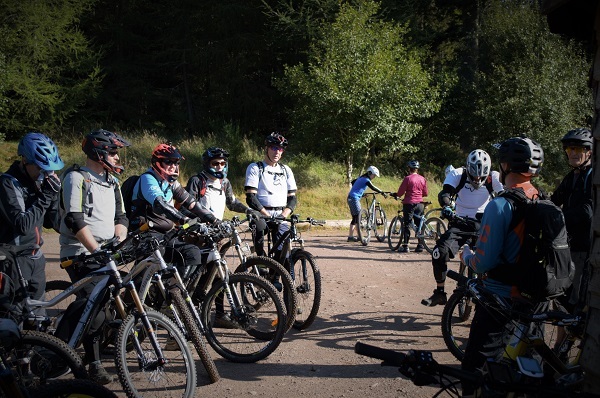 Glentress skills area was our first point of call, all 14 of us getting eBikes out of the vans was causing a stir with others in the car park. Questions were being fired from all angles – eBiking has truly taken a turn for the future now with people becoming more curious and accepting. A quick ride out of the car park with the group too the first initial skills area we had a quick talk about what our aims were, skills coaching for the morning before lunch and back out to ride Innerleithen. We split the group into two smaller groups and set to work getting their general riding confident on this new terrain using jumps, drops and rock gardens to improve their skills along the way. With a few minor falls and massive improvements the group was in high spirits we went back to the hotel for a battery charge and refuel our selves. Innerleithen Saturday afternoon was beautiful weather – blue skies with little cloud made the scenery amazing. Our climb was a little slower that normal due to the size of the group but we still over took many of conventional riders. The climb out of the car park and to the top of Inners is a pretty long one and the eBikes make it lighter work than it could be, still taking strain on our bodies going up most of us had a sweat on once we reached the summit. The clouds had blown over forming the skies to become less bright but the view was just as pleasing for everyone as our moral ready for the decent back to the vans. The decent is very flowly at Innerleithen which gave all of our eRiders a nice run to get them settled after the climb. There are some larger features within the decent in the form of rock drops and some reasonable sized table tops, all the way down is roll-able which is perfect for us as a guiding group. Back down to the bottom with the vans in sight made the group ecstatic, the group were over whelmed by what they had just achieved. Beers all round for a first day celebration and not too many because day two was going to get tough. Sunday breakfast was a little later, the beers the night before had effect on some of us. A definite slower start to the day meant we wasn’t fully awake heading out the hotel, shorts – batteries and shoes were left in the hotel by some of the team let alone the group. A quick round up at the hotel and off we went back to Glentress, a eBike issue had accrued so we changed our plans and sent the group off to the skills area while half the team got the spanners out to sort the malfunction. Bike issue done off we go, we all meet up at the skills area to regroup before enhancing their skills by riding down a flowly section of blue route and repeating over and over till tired. This seemed to be very good for the group watching the riders come through the same sections of trail repeating the course and improving every run. A little worn out we head back to the hotel for some grub and a recharge. As our plan had changed we decided to run our evening decent down Glentress climbing the red trail by day light and descending into the dark. The group were a little apprehensive but the team pulled their motivational speech’s to get them settled before heading down ‘Spooky Wood’ the first decent from the top. 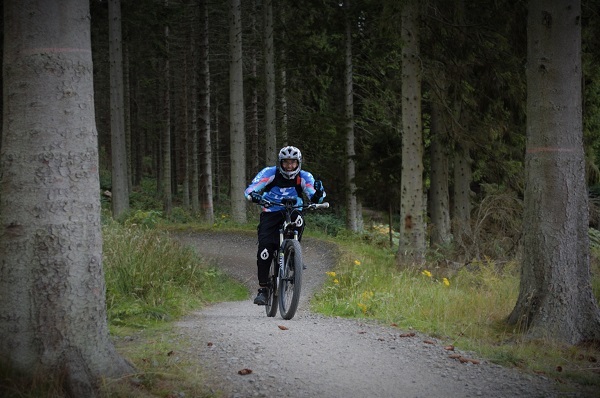 Glentress is a real joy to ride! Open trails leading into heavily wooded areas that flow well offering jumps, drops and roots between much loved hard packed trails. The light was dropping away from us minuet by minuet, our lights were on and the group was buzzing with excitement the further down the trail. Most haven’t ridden by candle light before so it was a little daunting for some, by the time we all plopped out at the end of the trail near the centre car park the group were exhausted but screaming with joy and rightly so as well. Back to the hotel where they kindly re opened the dinning hall for us to embark on some much needed food along with drinks, truly was such a great experience from every angle. Monday was our final breakfast (we love the breakfast at this hotel!) before saying our good byes and departing for another 6 hour journey back to the Midlands. We were all pleased and tired once we got in the van, we are still doing our clean up procedure a week later. Such an excellent holiday with many funny memories and great friends made through a weekends eBiking. Video to follow. To everyone who attended the UK’s first eBiking holiday, we thank you! © 2017 Mountain bike coaching|ProPhoto Photographer Template by NetRivet, Inc.